Integrated Database with Database Explorer – mirrors real world drilling projects making it simple to navigate between projects, wells, proposals and surveys etc. Software remembers last location in each project making it simple to switch between active jobs. Database Explorer provides easy-to-understand map of all projects in the database. Quantity of data is restricted only by size of computer’s hard-drive. Data Reference – provides single-click real-time switching between different measurement systems, Grid and True North references, and vertical and horizontal datums. Units are completely customisable yet easy to configure. Customisation – provision for custom branding of reports and plots using company logo, fonts and colour themes, plus export and import of custom configurations including preferred references, reporting options, display options etc. Coordinate Conversions – between local coordinates, geographical coordinates and virtually all known world coordinate mapping systems. Intelligent entry of coordinates and vertical datums allows for complete versatility in viewing data and printing reports. Magnetic Calculations – calculation of declination, dip and BTotal from well location and survey date using virtually all known magnetic models with option to manually enter magnetic parameters if preferred. Well-Planning – sophisticated well planning spreadsheet interface with intuitive “first-guess” solution allowing well-planner to adjust only the critical variables needed to tweak result. Innovative well-plan “stage” design eliminates the need for complicated collection of different projection methods. Allows the creation of unlimited number of well profile types from simple “S” wells through multi-stage 3D extended reach wells to numerous targets. Target Editor – provides easy creation of any shaped target from circular to complex polygon tilted with separate target plane and target entry attitudes. Targets may be shared between any number of well plans and surveys. Survey Editor – provides easy entry of survey data with intelligent data recognition allowing seamless entry of data in any recognised format. Customisable interface shows relative position and proposed inclination and azimuth etc. of associated well plan and offset well. A dynamic proximity feature shows name and distance to the closest well, closest hard line and closest formation top. Intelligent paste function facilitates easy copying from foreign documents such as PDF documents. 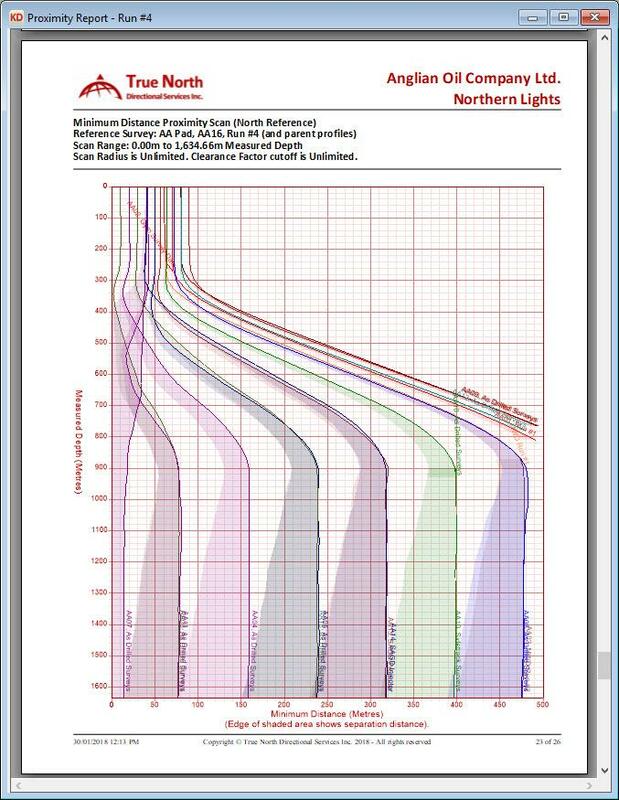 Comprehensive array of editing functions provides ability to adjust measured depths for wireline or pipe stretch, azimuths for declination corrections and inclinations for tool calibration errors and create composite surveys etc. 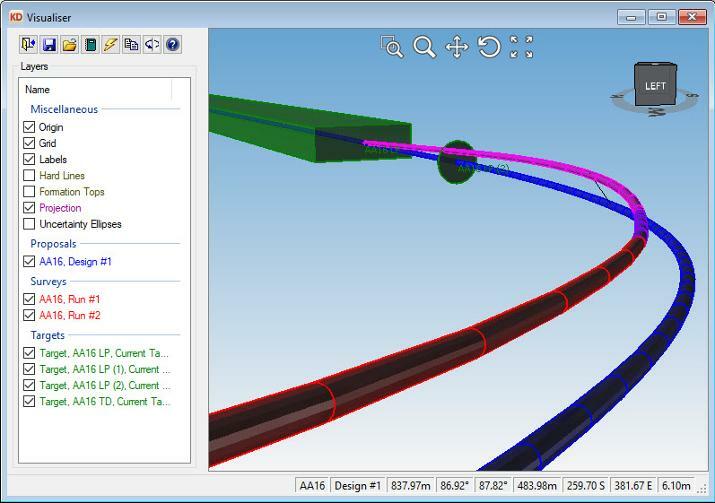 Intelligently handles sidetracks and multi-laterals and SAGD tie-on stations. Drilling Slidesheet – facilitates entry of drilling activities, times, survey data and slide and rotate lengths, from which ROP, Motor Output and Slide Ahead etc. is calculated enabling driller to predict future motor outputs. The slide-sheet is dynamically linked to forward projection modules providing accurate projection to the bit and forward projection to target etc. Drilling Records – full-featured drilling module records job details, drilling activity, drilling parameters, mud properties and BHA details etc. and outputs professional branded BHA reports, daily drilling reports, drilling run reports, end-of-well reports etc. Invoices – customisable job cost module with customisable price lists including repair/redress, discount and tax components outputs to selection of branded invoice reports. Data Export – proposal and survey data may be exported to a series of different export formats based on custom interpolation intervals and user defined units, north reference and coordinate and datum origins. Data Import – proposal and survey data may be imported from virtually any type of data file. Data import wizard allows user to easily define the parameters necessary to import the data from virtually any file type. Seamlessly imports data in any recognisable form and intelligently skips non-survey data. Data may also be intelligently copied and pasted from digital documents such as PDF files. Project Ahead – Correction Run, Ouija Board, Build/Drop/Turn and Trend Analysis modules first project the survey data to the bit based on a configurable slide/rotate sequence and then provides details on how to correct survey data back to the associated well-plan or achieve target. When called from the slide-sheet, the slide-ahead information is automatically transferred from the slide-sheet. 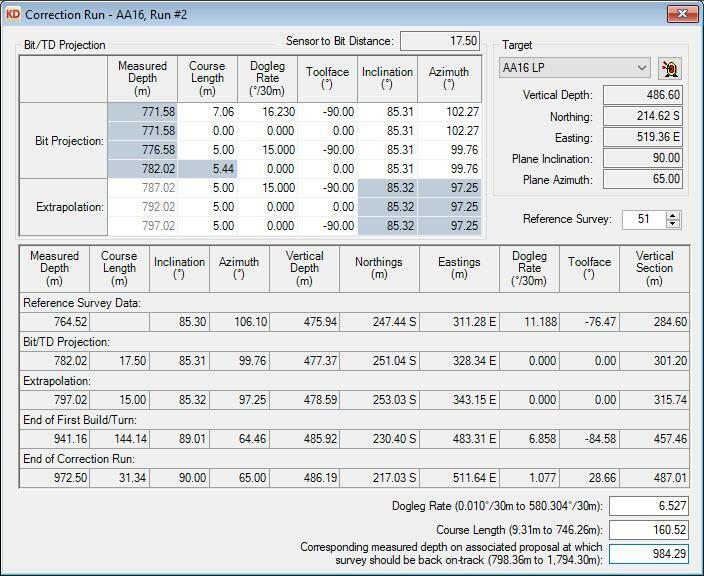 Correction Run – corrects the survey data back to the associated well plan based on a defined dogleg rate, course length or measured depth on the well-plan. Ouija Board – projects the survey data to any of the associated targets using a selection of parameters such as course length, inclination, azimuth, vertical depth, dogleg rate and/or toolface azimuth. Build/Drop/Turn – calculates the build and drop/turn required to hit any point on the target plane. Trend Analysis – projects existing survey data forward along the current trend and calculates where it will penetrate the target plane. All project-ahead modules are dynamically linked to the KellyDown Visualiser allowing the user to clearly see how the projections relate to the survey data, the proposal data and the target. The 3D Visualiser is instantly updated as the user adjusts each projection or switches between each of the project-ahead modules. Import and Export – complete projects, structures and wells etc. are exported and imported between databases providing easy updates of rig-based computers with updated data from the office. 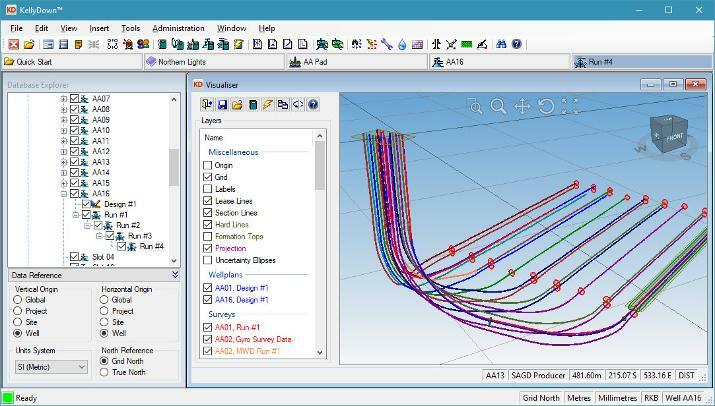 Slot Coordinates – a slot template wizard makes it easy to configure multi-well pads and structures. The slot coordinate spreadsheet allows the user to enter slot coordinates based on local, map and/or geographic coordinates relative to any pre-defined datum. A graphics window shows a schematic representation of the slot layout. Lease Lines, Section Lines and Hard Lines – may be entered relative to local, map or geographical coordinates or based on sequential distance and direction and viewed in a graphics window. Casing Program, Survey Program, Formation Tops and Profile Comments – are entered via intelligent spreadsheet interfaces and are viewed in a graphics window. Reports – reports of all elements of KellyDown are quickly and easily produced and previewed or sent directly to a printer. Reports are customised according to either the company or client branding and configured to include various elements referenced to any of the predefined horizontal or vertical origins, north reference or units systems. Reports may be instantly forwarded to pre-defined email recipients at the click of a button. Plots – single-well and multi-well horizontal and vertical section plots are viewed onscreen and are dynamically manipulated using mouse moves while the scale is updated in real-time, thereby providing a simple-to-use method of producing small scale plots. Anti-Collision Scans – all wells in a project are scanned for proximity using an efficient logic that quickly eliminates profiles that do not pose any threat of collision. Wells that are a threat are scanned in detail to produce either a summary report or detailed report that includes a Ladder Plot, Clearance Factor Plot and Travelling Cylinder Plot. Scans optionally include uncertainty data based on ISCWSA error models with ellipse separation and clearance factor data. A dynamic quick-scan option provides a real-time proximity scan whilst proposal or survey data is entered and/or modified. Quick-Well Wizard – helps users who are more familiar with less sophisticated directional drilling applications to easily add new wells to a KellyDown project. The user may add all the basic information in a single well configuration screen and the wizard will create the necessary database elements in the background. Automatic MWD Monitoring - may be configured to automatically update survey data from MWD surface computer. Remote Monitoring – survey data may be seamlessly and dynamically updated on remote office based computers using DropBox™ or OneDrive™ technology thereby providing remote operations solutions at minimal cost. Remote stations are instantly updated and may be configured to continually monitor anti-collision with audible alarms. 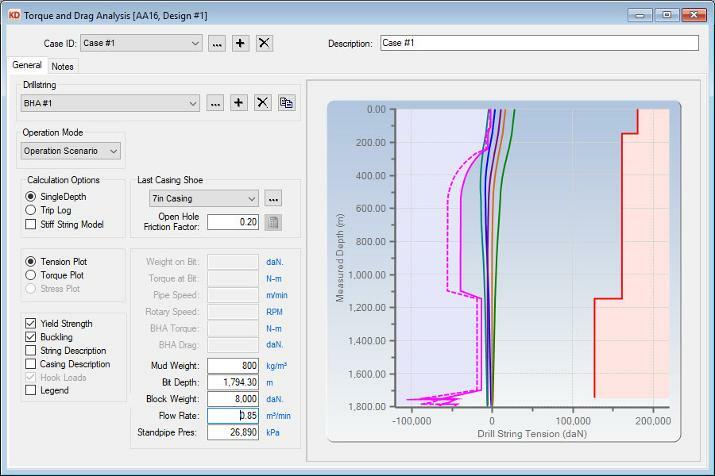 Torque & Drag Analysis – provides a sophisticated yet user-friendly analysis of the tension, torque and stress acting on the drillstring based on various drilling scenarios such as pick-up, slack-off, rotating pick-up, rotating slack-off, rotating off bottom, rotary drilling and oriented drilling. 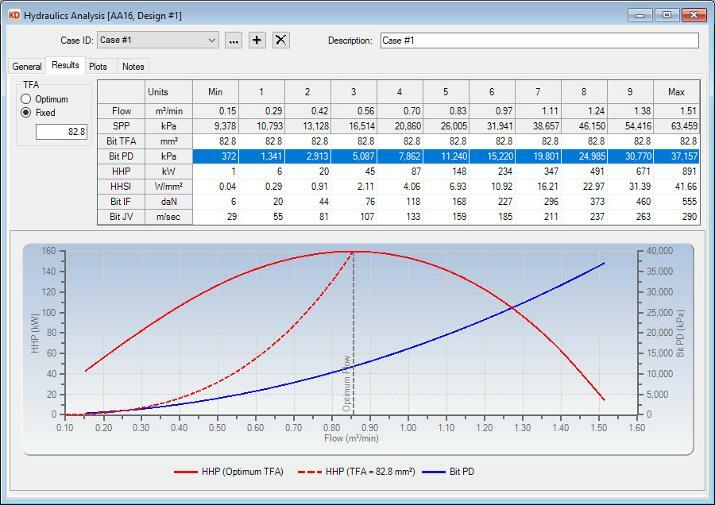 Hydraulics Analysis – calculates optimum hydraulic horse power and impact force and performs sensitivity analysis of fluid flow though all components of the circulating system. Survey Analysis – used to determine whether raw MWD data is within acceptable tolerances by presenting the data in both tabular and graphical form and comparing calculated values against earth’s theoretical and/or measured values. Search Database – finds proposals and surveys based on user-defined search criteria such as customer name, well name, survey date and/or maximum depth or displacement etc. Search results may be selected in the database explorer allowing for subsequent export of selected profiles. Administrative Tools – allow other users to be added to the database with defined access privileges. 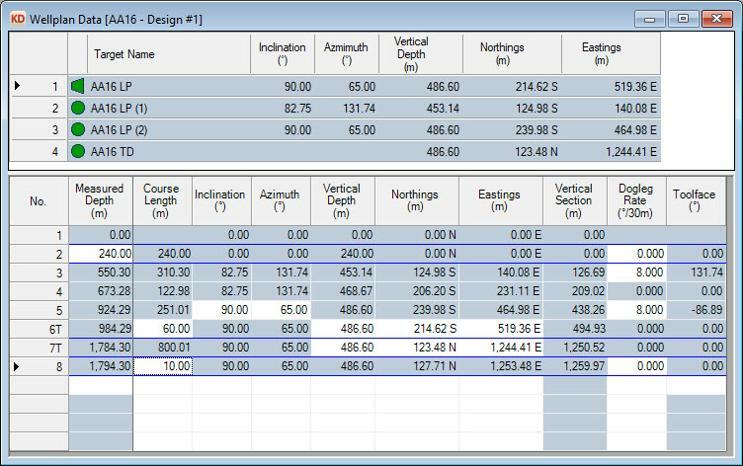 Modify or add units systems including conversion factors, data formats and minimum and maximum allowable values. Update drop-down lists and define such frequently used elements as formation tops, magnetic models, survey tools, BHA components and program aliases (alternative descriptions for common terms used by KellyDown such as Structure, Well, Proposal and Survey etc.). Database Management – database may be backed up and restored, and new databases created. Projects, wells and profiles are easily imported from foreign sources such as Landmark's Compass™ transfer files. 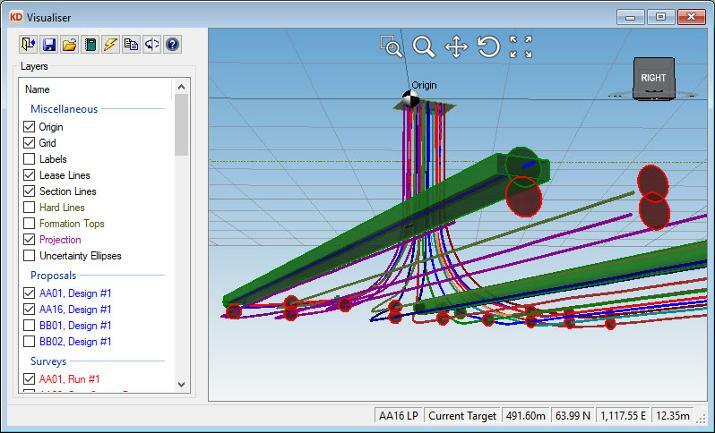 KellyDown Visualiser – aids the well planner and/or directional driller in visualising the geometry of the individual wells within the drilling project. The Visualiser is dynamically linked to other KellyDown modules so the user can observe how slight modifications to a well plan affects its relative proximity to other wells. The Visualiser is also useful in understanding how the forward projection modules project surveys to targets and/or correct surveys back to the well plan. Help – fully integrated help system provides task-based help on all aspects of the KellyDown software. Check for updates and seamlessly install new versions of the software and/or help manuals. Support – unparalleled support provided utilising remote access utility from within the application.